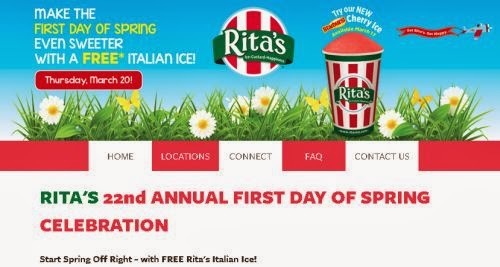 Start the first day of Spring with a free Rita's Italian Ice. Stop by any participating location to get your free 22nd Annual First Day of Spring Rita's Ice. Thursday, March 20 from 12PM-9PM to enjoy your first taste of spring on them, and try their exciting NEW STARBURST® Cherry Italian Ice! Click the link below to go to Rita's website to read the details.